This song really spoke to me in many ways. The song is what the character Elsa from Frozen sings when she is finally free from her fears, and is finally able to be herself. I went through the same thing and in ways am still going through the same feelings that this song talks about. The feeling of letting go of what others may think of you, and just being yourself. An important lesson that I had to learn and I now live by. I chose this picture due to my conflicted choices in lifestyle. I chose that I want to be an animator/cartoonist and to say the least I live my life a little childishly. However, I'm also a cheerleader for the school and a very responsible athlete and student. This odd combination as well as a few other conflicts in my personality and life are the reason why I chose this photo. The blue represents my calm, organized, and responsible cheerleader and student side. The orange represents my energetic, crazy, wild, and childish side that loves cartoons and drawing. 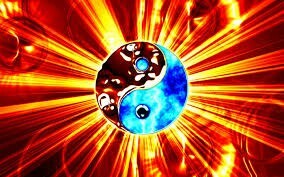 The fire around it represents my firey passion for anything that I do, and the symbol of Yin and Yang pulls it together as these elements exist in harmony in one person. ME! This article depicts a popular animated short that came along with the movie "Frozen" called "Get a Horse!" This is taking a classic black and white animated cartoon and turning it into a more modern day version of itself. This is part of the future of animation as not just bringing in the new, but showing that modernizing the old can be just as affective and even just as popular.